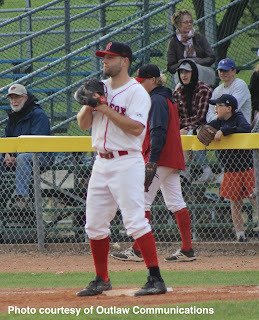 The battle for first place in the Eastern Division continued at Mitchell Field in Swift Current on Monday night. The 57’s rallied from an early two run deficit to score seven unanswered runs to defeat the Regina Red Sox 7-2. With the win Swift Current and Regina are tied for first with identical 27-15 records. Weyburn is hot on their heels with a record of 26-16. Mitch Guiberson earned his second win of the season throwing six innings. He allowed two unearned runs on six hits and three walks. He struck out two before handing the ball to the Swift Current bullpen. The combination of Layne Downing and Jagger Harjo shut down the Red Sox hitters in the final two innings. Brendan Hornung who made his second start for the Red Sox, took the loss. The right-hander from the University of Hawaii gave up 12 hits and seven runs in 5.2 innings pitched. Derek Slate, the senior from Point Loma Nazarene, has two hits and a walk but drove in both Regina runs.